Got Questions Part 8: What is the Lord’s Supper? 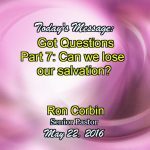 Got Questions Part 7: Can we lose our salvation? 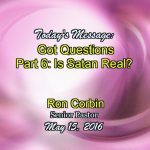 Got Questions Part 6: Is Satan real? Got Questions Part 5: What is Sin? Got Questions Part 4: Why does God send people to hell? Got Questions Part 3: How do we know the Bible is true? Got Questions Part 2: Why are there so many religions? Got Questions Part 1:Why do bad things happen to good people?